Editor’s note: This is part of a series on NextBillion Health Care regarding the lack of safe, basic surgery in much of the developing world. The first installment can be found here, the second here. Few of us can imagine the horror of waking up midway through a surgical procedure. The malfunction of anesthesia is a rare occurrence in modern medicine but when it does happen, the accounts of the experience are enough to discourage anyone from undergoing surgical care ever again. Beyond the psychological trauma of awakening, conscious but paralyzed on the operating table, interruptions in anesthesia delivery can cause permanent brain damage, disability or death. Anesthesia care is popularly perceived to be the management of pain and the maintenance of a state of sleep. What’s missing from this perception is that the anesthesia provider manages coexisting medical problems like high blood pressure, anemia, diabetes and heart disease, treats the medical interactions between surgery and the patient, treats the interactions between the anesthetics and the patient while simultaneously providing any necessary life-support through the maintenance of the respiratory and cardiovascular systems. Fortunately, for those who receive health care in high-income nations, multiple safeguards and extreme diligence relegate the surgical anesthesia mishap to the realm of freak accident – a very minimal risk compared to the great benefits that surgical care provides. However, that does not give us license to ignore the fact that the threat of surgery with no anesthesia or failed anesthesia is very real in many parts of the world. Choosing a course of medical care always involves some weighing of the risks and benefits. Few interventions in modern medicine are risk-free, but we trust our providers and our health system to do everything they can to reduce potential harm. The amount of risk that we are willing to take on as patients depends on a number of factors – age, severity of the condition, quality of life. This calculus is slightly different for each individual within a particular health system, but it shifts dramatically as you move to different settings, where a procedure with the same amount of benefit carries very different risks; where waking up during a surgical procedure is a very real and common danger; where a basic caesarian section or hernia repair has a high likelihood of causing a life-threating infection or a permanently damaging hypoxic event. Such procedures are part of the foundation of basic primary care, and the ability to perform them safely relies on knowledge and technology that was widely adopted after it was developed in the 20th century. While health innovators channel energy toward further refinement and systematization of safety precautions in order to shave more percentage points off of the very small amount of risk posed by procedures in modern facilities, the divide between the nature of the risk people in different parts of the world must assume grows wider. It’s hard to really understand just how large that gap is, and how big of a leap in standards of care is called for, until you see it for yourself. For example, we expect nausea, vomiting and even some indigestion to be a normal part of pregnancy. These common symptoms are a result of the hormonal and anatomical changes that go along with the growing fetus. Well-equipped doctors understand this and as a result of decades of experience protect our lungs from the stomach’s acid and food should we need to go to sleep during a caesarian section or other emergent surgery. We expect to have a skilled anesthesia provider who will have adequate medications, a limitless supply of oxygen – the most essential and frequently used medication for the anesthesia provider is actually oxygen – and well-functioning equipment. We understand that even in the face of medical challenges such a well-equipped provider will be able to bring the mother and child through the experience safely. These expectations cannot be met in parts of the world where there’s an inadequate oxygen supply, an unstable electrical grid and with anesthesia machines that were designed for a high-resource environment in the United States or Europe. Without oxygen and electricity, anesthesia machines that are optimized for high-resource countries simply do not function. Anesthesiologists in wealthy nations use complex machines to monitor multiple functions throughout the body, from a patient’s breathing to the level of carbon dioxide in their blood. If these complex machines are not maintained properly the blood can become highly acidic, vital organs such as the brain and heart can suffer from oxygen deficiencies and the kidneys can suffer from poor blood flow. High expense, maintenance and a dependence on electricity make these high-resource optimized anesthesia machines utterly useless in resource-strapped health care settings. The majority of health care facilities in sub-Saharan Africa do not have reliable access to electricity. If they have access at all, these facilities face weekly or even daily outages that make putting a patient’s consciousness during surgery in the hands of an electricity-dependent anesthesia machine a dangerous proposition. We can all agree that the possibility of a patient gaining consciousness during surgery is an outcome that should be avoided at all costs. Entire countries (for example, Sierra Leone) may have only one or two oxygen-producing plants in service with fresh oxygen tanks requiring transport hundreds of miles. The alternatives are to perform simpler procedures without general anesthesia, to use a less reliable and more difficultly monitored method such as ketamine, or to forgo surgery altogether. These are not acceptable options. The paternalistic implication that surgical care is simply too expensive, technologically advanced or infrastructure-dependent to be safely done in middle- or low-income countries deprives those populations of basic, essential care. Instead of expecting settings in other parts of the world to adapt the exact structures and systems that support safe surgical care in wealthy nations, it is time to look at local circumstances as they actually exist and use innovation to create solutions that will make a basic standard of care available to everyone. Electricity-optional anesthesia machines have been developed by both the Diamedica and Gradian companies. These low-resource optimized anesthesia machines are beginning to be used in some places where they are needed. International efforts by the Lifebox company to assure that pulse oximeters are used by anesthesia providers globally are helping to assure that surgical patients do not suffer life-threatening levels of low oxygen while they are asleep from anesthesia. 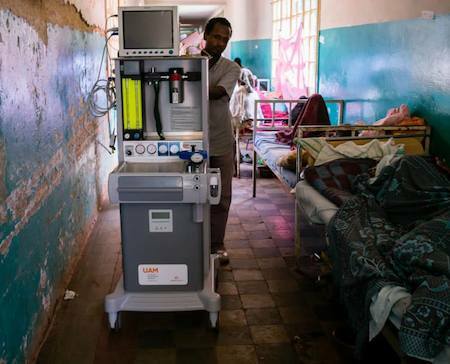 The next step is to make sure that these machines are rapidly scaled to meet the huge needs that exist, and for them to be accompanied by other interventions that can improve the safety of surgical care for low-resource settings. Partnerships between international companies, academic centers for global surgery, and local health care institutions are an important way to facilitate distribution and necessary training. The companies listed above are now working with experts from Johns Hopkins, Harvard and other top universities with global footprints to develop feasible training methods in collaboration with local providers. Such collaborations help to encourage the distribution of these machines to the places that need them most and are prepared to use them correctly. Besides anesthesia, surgical instrument sterilization and health care worker training are the other critical pillars that support essential surgery. The risk of a surgical procedure should never be dictated by the availability of these three fundamental components, no matter where the care is provided. Dr. James Bernstein is the co-founder, chairman and CEO of Eniware and Dr. John B. Sampson is founder and president of Doctors for United Medical Missions.